This quote is often heard, particularly regarding the validity of anthropogenic (man-made) climate change. This article will not participate with the climate debate at all, but it does bring up a point on how we view the authority of scientists, and whether science is something provable, or merely an opinion to which we can agree or disagree. For centuries, the religious powers felt their viewpoint was incontestable or infallible, and that the fledgling discipline of scientific inquiry was blasphemous. 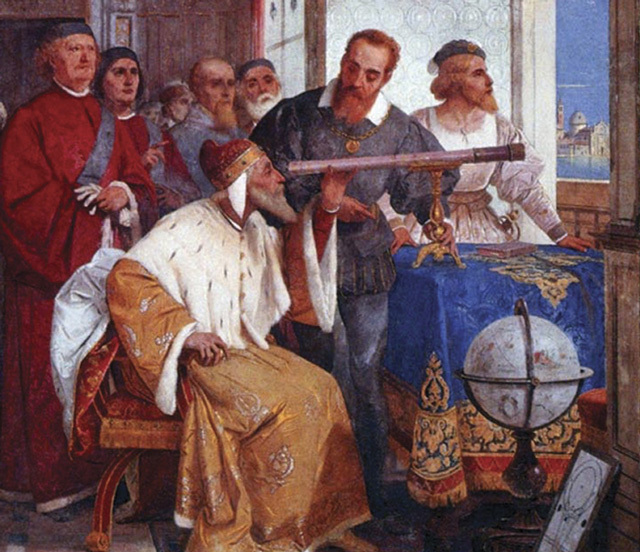 We need only to look to Bruno (burned at the stake), Copernicus (who chose that his book be published only after he died) and Galileo (who spent his last 20 years under house arrest) – all astronomers who used scientific methods to prove that the sun, not the earth, was at the center of our planetary system. Now, the tables have been reversed and it is “science” that cannot be questioned, and all religious beliefs are superstitious. But is there a difference? It seems as though the authority of the day has merely been shifted from one camp to the other. This change didn’t happen overnight, but brick by brick, the godly beliefs about the natural world have been torn down and logical, scientific explanations have taken their place. Thunder is no longer the anger of the gods and the earth is no longer the center of the universe. This is progress, based on observation, experimentation and replication, or, the scientific method. One of the hallmarks of the scientific method is that any experiment must be replicated with the same results achieved before a theory or hypothesis can be proven. These working ideas must be subjected to a battery of objective tests that are beyond human opinion and wishful thinking. Unfortunately, some theories have crept into becoming pseudo-laws, especially the ones that are more difficult to prove. The so-called Big Bang theory of the origin of the physical universe is one that seems to have taken on the status of a law. I have heard scientists say, “Before the Big Bang…” or “…just after the Big Bang,” and so on as if it were true. But even though it may be a widely accepted hypothesis, it has not at all been proven. In fact, it almost seems like a modern creation myth, particularly regarding the singularity that gets ‘blown up’ in the first place. We don’t know what this singularity may be, although it sounds much like the Chinese concept of the Tao, or undifferentiated whole. This ‘bang’ would require a huge amount of energy, yet we have no idea how or why it might have happened. To a certain way of thinking, it would take nothing short of a miracle for the Big Bang to exist, and this should make all scientists skeptical of the theory. The hubris many in the scientific community have about their assuredness regarding natural phenomena should worry everyone, not just scientists. It puts a limit on what is possible and builds a wall of protection around those who came up with these theories. But, with true scientific investigation, even the most deeply-held theories can fall apart. Professor Langley ‘proved’ with his aerodrome that heavier than air, powered flight was impossible. Just a few short years later, the Wright brothers proved otherwise. Sometimes, it takes a small group of dedicated scientists to uproot an entrenched theory. In the 1980’s, two Australian medical researchers turned the scientific community on its head with their discovery that ulcers were caused by bacteria and not stress or spicy food. This went squarely against what had been deeply held beliefs about stomach acid and ulcer formation and they were publicly shamed for their crazy ideas. Years later, they would receive a Nobel Prize for their work and what we know about stomach ulcers has been completely changed. It’s been said that more scientific advances are made at funerals than in the laboratory. This goes to show that some beliefs, including scientific beliefs, can become so defended that it takes the death of their founders and their followers before they can be challenged and replaced with newer scientific evidence. Science was originally devised to remove superstition and opinion from the observation and explanation of natural phenomena. Experimentation, empirical evidence and reason were meant to prove the fact of something, which would no longer require someone to believe in it or have to take it on faith. Now we are often asked to believe in science just as we were required to believe in the Church centuries ago. So, is the science ever settled? Probably not, although we may have working models that serve our current time just fine until better ones are discovered. Is science infallible? No, although one could say that ‘Science’ is never wrong, yet scientists often can be. Should we stop questioning things and just ‘believe in science’ and ‘take it on faith?’ Never.